Visitors to our B & B get a rare treat - the chance to savour wonderful breakfasts prepared by an award-winning chef! Steve Marston is more than "Just an Innkeeper". He is an accomplished " Foodie" with an impressive background. Steve's love and appreciation for fine cuisine has taken him around the world. He has been named Bermuda "Chef of the Year" and Escoffier Cup winner. Steve has been an executive chef for over 40 years in England, Bermuda and here in the Okanagan at Quails' Gate Estate Winery. His passion for food and wine pointed him in the direction of opening A View of the Lake B & B in 2006 with his wife Chrissy. Steve is always looking for fresh ideas and trends, utilizing the best of fresh local produce and ingredients. His eclectic combinations of international flavours will delight your taste buds at the breakfast table in the morning. Steve frequents farmers markets and local wineries in order to obtain the best fare for all his Bed & Breakfast visitors. Breakfast is a focal point of our visitors' stay. Our guests can take advantage of the different start time options, then relax and enjoy a leisurely meal. Your hostess Chrissy is pleased to serve 3 delicious courses, beginning with an intriguing sweet starter, followed by a fruit dish and then the main course. Our View of the Lake Bed & Breakfast can accommodate all dietary needs, thanks to having our own professional Chef! Steve's career as a professional chef has been long and very interesting, taking him around the world. He has won many awards as well as participated in many well-known events. Sent to the Bocuse D'Or Lyon France 2007 to attend the World chef competition. 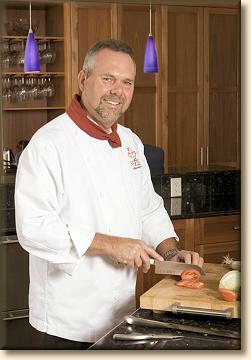 Head judge for Bermuda chef of the year food festival with Anthony Bourdain in 2005 and in 2006 with Bobby Flay. Special thanks to everyone who uploaded breakfast pictures to their Tripadvisor Review - click on each to enlarge.